The Brother HC1850 is a computerized sewing machine that comes with an abundance of features all aimed at making sewing faster and more efficient for the user. Anyone that has a passion for sewing – beginners and experts alike – will find that this is a complete sewing machine that can handle any project you throw at it. And priced under $200, it’s so affordable that even beginners will find that this machine will make any sewing project much easier to complete. Before we discuss all of the features in detail, let’s take a look at all its features and specs. And when you sit down to begin sewing, the bright light will illuminate the entire surface of the sewing machine. When we first saw this sewing machine, we knew that we had to give it a try ourselves to see how robust this machine was. The results were very impressive, with the HC1850 surpassing our expectations at every chance. If this is your first sewing machine, you’ll have a lot of questions along the way. Learning how to setup your machine for your first project is always tricky at first, but Brother has included an instructional DVD that aims to make sewing simple and easy. When you start the machine, you’ll be able to turn on the LED light to illuminate your work area, and an LCD screen allows you to pick all of your stitches quickly and easily. An automatic needle threader allows you to thread a needle – minus pricking your finger. This is a priceless feature. Users only need to move the lever as it pushes your thread through the eye of the needle. And when you need to set the bobbin, you’ll simply drop the bobbin in the bobbin location and pull the thread through the slot to get started. It takes under a minute to do, and you’ll be on your way to sewing your project within 5 minutes of sitting down. There are so many stitches offered, we almost lost count. There is also a built-in monogramming font set. Stitches are selected using the LED lighted screen and the push of a button. A chart is included on the front of the machine that lists every stitch. The chart allows you to make your stitch selection in seconds so that you can start sewing as fast as possible. Speed Adjustments: There are three sewing speeds offered to sew quickly through thin material, or slowly through thick material or difficult patterns. Width: Users can adjust the width of each stitch. Length: The length of each stitch can be adjusted. All adjustments are as simple and accessible as possible to make your sewing project a breeze. Keep in mind that you cannot adjust the sizing of the lettering stitches. All of the lettering stitches are ¼” in size. Wide table perfect for large projects. Foot control, allowing you to control your sewing speed. All you need to do is unpack the box and be confident that this model has everything you need to tackle your upcoming sewing project. This machine isn’t advertised as a heavy duty machine, but even when sewing through denim, this model is able to work its way through multiple layers of fabric. While small quilting projects can be done on this machine with ease, we don’t think it offers a true environment for quilters. The presser feet do not rise enough for thicker quilts, and the neck of the machine is on the smaller size. But this is only an issue for serious quilters. If you need a quilting machine we highly recommend the Brother PQ1500SL. You can visit this page to see the other sewing and quilting machines we recommend. For most users, the machine will be fine for their quilting needs. With accessories, 130 stitches, a wide table and full control over the sewing process, you won’t find many machines in this price range that can compare with this model. 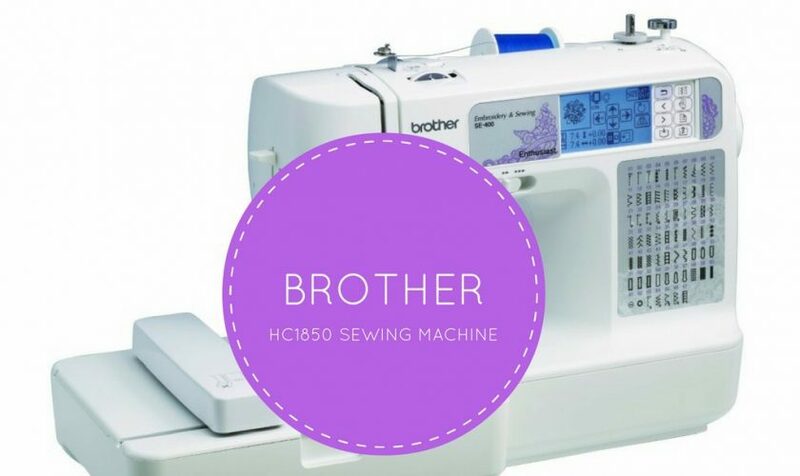 => Click here to purchase the Brother HC1850 computerized sewing machine. I noticed a second picture above with the embroidery attachment but it is a different model. (SE 400). Do you have a review on that model for its quilting abilities? Unfortunately, I didn’t use the SE400 to create any quilts. I’m sure it is capable of it, but can’t really comment from personal experience.